A low vine of moist forests, shores, river-bank thickets, marshes and meadows, wet prairies, streamside. Strings of edible tubers are produced underground and can be prepared like potatoes. The flowers are normally a very deep red- or purple-brown, with a strongly curved, even coiled, keel. Rarely, young plants will bear mostly or only trifoliolate leaves; these can be distinguished from Amphicarpaea by the relatively large perennial underground tubers. Amphicarpaea is a fibrous rooted annual (but do not mistake the large underground seeds of Amphicarpaea for tubers). Michigan plants are mostly, if not entirely, sterile triploids (see Simon & Bruneau, 2004), rendering baffling their dispersal throughout much of the state. No fruiting specimens from Michigan are in the holdings at MICH. 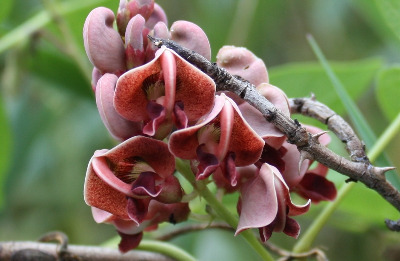 The fruits, when produced, are elongate, glabrous, slightly flattened legumes, lightly constricted between the large, dark brown, glabrous seeds. MICHIGAN FLORA ONLINE. A. A. Reznicek, E. G. Voss, & B. S. Walters. February 2011. University of Michigan. Web. April 20, 2019. https://michiganflora.net/species.aspx?id=1271.